With one single judgement, the Delhi High Court disposed of 3 different writ petitions filed by IRIA, IMA as well as Sonology Society of India respectively and clarified a number of questions related to the PC-PNDT Act, finally declaring Rule 3(3)(1)(b) of the PNDT Rules (as it stands after the amendment with effect from 9th January, 2014) as ultra vires to the extent it requires a person desirous of setting up a Genetic Clinic / Ultrasound Clinic / Imaging Centre to undergo six months training imparted in the manner prescribed in the Six Months Training Rules. The judgement indeed saw a great divide being created in the medical fraternity with most MBBS rejoicing with the decision while many radiologists opposing it. IRIA reportedly challenged the decision in the Apex Court . However, despite the landmark judgement, many complained that there was no implementation of the same. Many MBBS doctors came out complaining that the health departments were ignoring their demands of registration citing no concrete reason. In the meantime, an appeal was filed with the Supreme Court, challenging the decision of the Delhi High Court. This was done both by IRIA as well as Supreme Court of India. It is reported that during the hearing on 25/07/2016, the hon’ble court clubbed the two petitions . Further, it is further added that while the court issued notices to other parties, it did not call for a stay at the high court judgement, implying that MBBS can still continue to practise ultrasound in the capital for the time being. Radiology is nothing to do with sonology. For convenience and make quick bug, and lack enough skills with interventional radiology most of the DMRD and MD radiology guys become the sonologists. Any body can be good at sonologist., SPECIALLY in his own field. Obestrerics & Gynaecology, Emergency medicine, musculoskeletal system, cardiology, uronephrology and general physician and surgeons for that matter MBBS Degree HOLDER\’S. What is this 6 month course that is required before practicing Sonology after mbbs? Where can I do it? An MBBS d0c I\’d very much eligible as he has all basic experience on medical science i.e. anatomy and pathology which are essential in USG practice. Rest knowledge of sound physic and practical application can be acquired easily with one to six months of training. Mind it that USG manipulation is not rocket science go medical graduate it is a basic tool nowadays and a life saving approach. Asking for patency of this basic tool by some group may definitely going to harm people at the receiving end. I strongly fell that this important basic tool is much more as good as stethoscope . But authority has lot of other measures that can easily prevent it\’s misuse. PC-pNDt is doing good job but good use of it has more bigger role towards humanity than other aspects. There should be stoping of fightings b/n Radiologists and sonologist. 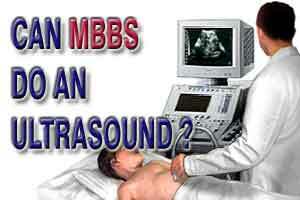 Now MBBSDoctors with 6months certificate course can do Ultrasound is a very good decision. Radiologists can do USG,CT,MRI.MAMMOGRAPHY XRAYS and other INUTERO PROCESS,thay should give opportunities to sonologists,LIVE AND LET LIVE OTHERS.MOTTO THEY SHOULD FOLLOW. shoot all the doctors in india and finish this debate forever. no doctors, no issues . . . .